Jason Stanley, "How Fascism Works"
Fascist politics are running rampant in America today—and spreading around the world. A Yale philosopher identifies the ten pillars of fascist politics and charts their horrifying rise and deep history. Stanley knits together reflections on history, philosophy, sociology, and critical race theory with stories from contemporary Hungary, Poland, India, Myanmar, and the United States, among other nations. He makes clear the immense danger of underestimating the cumulative power of these tactics, which include exploiting a mythic version of a nation’s past; propaganda that twists the language of democratic ideals against themselves; anti-intellectualism directed against universities and experts; law and order politics predicated on the assumption that members of minority groups are criminals; and fierce attacks on labor groups and welfare. These mechanisms all build on one another, creating and reinforcing divisions and shaping a society vulnerable to the appeals of authoritarian leadership. Jason Stanley is the Jacob Urowsky Professor of Philosophy at Yale University. Before coming to Yale in 2013, he was Distinguished Professor in the Department of Philosophy at Rutgers University. Stanley is the author of Know How; Languages in Context; Knowledge and Practical Interests, which won the American Philosophical Association book prize; and How Propaganda Works, which won the PROSE Award for Philosophy from the Association of American Publishers. He is a frequent contributor to The New York Times, The Washington Post, The Boston Review, and The Chronicle of Higher Education, among other publications. Stanley lives in New Haven, Connecticut, with his family. 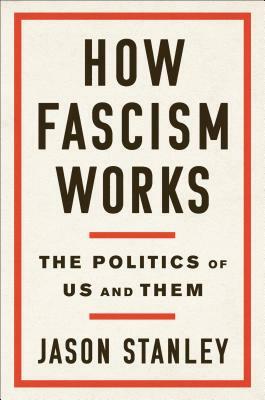 If you're unable to attend the event and would like a signed copy of How Fascism Works, please purchase the "Signed" version below.